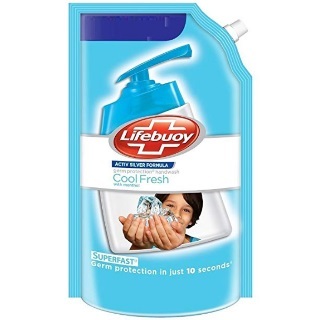 Amazon Sale - Purchase Lifebuoy Hand wash 750ml worth at Rs.175 at just Rs.129. Lifebuoy Handwash makes hand washing quicker and more effective than ever before! Lifebuoy Nature Hand Wash contains our patented germ kill formula ensuring your hands are clean and protected against germs. The special formula is proven to remove 99.9% of germs in just 10 seconds and designed to give you the protection you and your family need. The handwash prevents the spread of germs, keeping the family safe from 10 infection causing germs. It will leave your skin feeling protected, cleansed and refreshed.